Teenage Posh striker Deon Moore has a big fan in manager Grant McCann. Photo: Joe Dent/theposh.com. Peterborough United manager Grant McCann insists 17 year-old striker Deon Moore is the real deal. 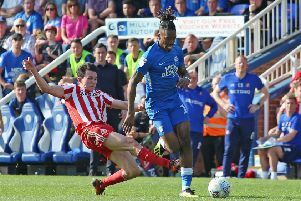 Moore has burst from the youth team ranks this season to challenge for a place in the Posh starting line-up. Posh striker Paul Taylor has impressed manager Grant McCann this season. Photo: Joe Dent/theposh.com. And McCann insists Moore is there on merit. He’d happily throw him into the League One match against Port Vale at the ABAX Stadium on Saturday (September 10). Moore has made one first-team appearance so far, as a substitute in the 6-1 home defeat at the hands of Norwich Under 23s in the Checkatrade Trophy. “Deon deserves to be in the first-team squad,” McCann stated. “I don’t look at his age, I look at his ability. He is a very gifted striker. “He’s a man in my eyes anyway. He’s strong, quick, technically good and he can run in behind defenders. “I like him a lot and I wouldn’t hesitate to play him in a League One match. “Posh fans saw a glimpse of him in the Norwich game, but that’s all it was. They will love him. Moore will probably be among the substitutes for the Vale match as McCann is expected to keep faith with Paul Taylor and Tom Nichols up front. Shaquile Coulthirst has fallen from favour and likely to allowed to leave Posh in January. McCann added: “I’m happy with the forwards I have available. “I’ve been pleased with Paul Taylor’s contribution, although he should be scoring more goals. “I have brought him back to the club as a centre forward who can score goals at this level so we need to get him behind defenders as often as possible.